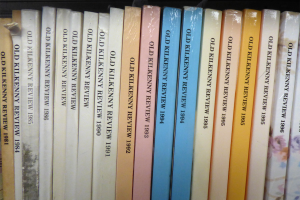 Kilkenny Archaeological Society annually publishes the Old Kilkenny Review. It is free of charge for members of the Society. Current and older issues are available for purchase in Rothe House. The History Talk committee researches topics of local interest and broadcasts them on local radio stations. KAS has cooperated with KCLR and Kilkenny Community Radio in the past.